Spring Bouquet Still Life tapestry shows a gorgeous arrangement of flowers on a vase and bowl in a setting with a beautiful play of light. In this piece there is a masterful play of hardness and softness in the image, almost in a dreamlike fashion, to show the textures of the flowers and the leaves in a most original and wonderful way. This work takes the best of composition and balance principles from the Dutch master painters and a new perspective on this genre with its use of light and focus. It is an idyllic way to bring the beauty of nature indoors. 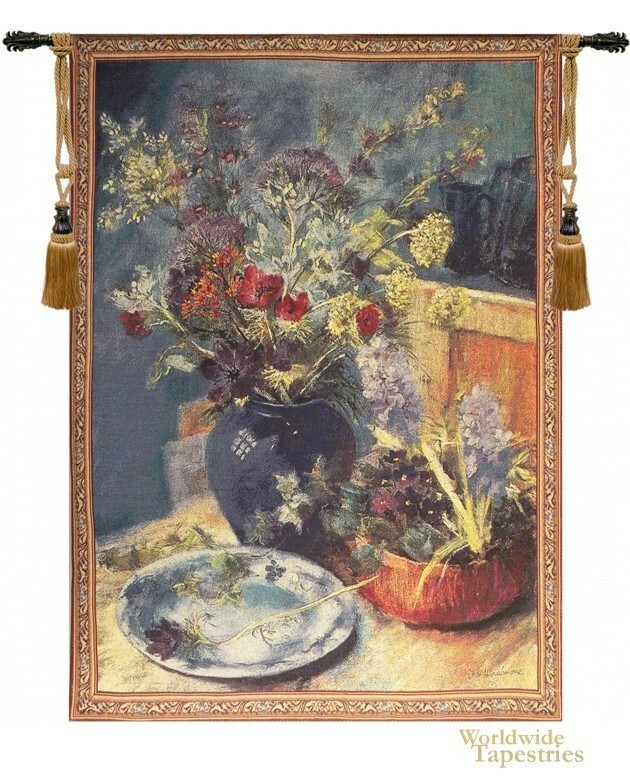 Spring Bouquet Still Life tapestry is backed with a lining and a tunnel for easy hanging. Note: tapestry rods and tassels, where pictured, are not included in the price.